We are happy to announce two shows that we are very excited about. We are playing at Viracocha in San Francisco on July 15th with The Lowest Pair, and at the UC Berkeley Redwood Grove Summer Concert Series on August 6th. Can't wait to play for our Bay Area family. The folks from The Bay Bridged gave our new EP a nice review. Check it out! We had a stupid good time on Saturday with all you fine folks. Thanks so much to TaughtMe and decker. for adding such great music to the night. Stay tuned for photos. For our first ever appearance at the Rickshaw Stop in San Francisco. Doors open at 8pm. Our set begins promptly at 830pm. Andrew Laubacher and Kelly McFarling will be joining us the entire night. Brad Brooks and Felsen close out the evening. Come one come all! We are very proud and humbled to announce the song Suitcase won Runner Up for Best Song by an Oakland Band for the first ever Oaktown Music Festival. We would like to thank all of the talented participants, Oaktown Indie Mayhem, Awaken Cafe, and all the great people in Oakland who have supported us along the way. A special thanks to our friend Jeremy Hatch for nominating the song, and a congrats to our good friend Tom Rhodes for winning Runner Up for Best Song by an Oakland Solo Artist! Looks like Runner Up runs in the family! Come join all the winners for 2 days of music at Awaken Cafe Nov 15th and 16th. Celebrate Oakland music! The Owl Mag's Don Albonico was in attendance on July 20th to snap some photos and he had some nice things to say about the band as well. Check out the article and photos! "Beautiful blend of vocals and strings ... The instrumentals and vocals featured on Lia Rose's album When You Need Me Most each possess a quiet strength. The two work together, one never overshadowing the other, making this a successful solo effort for the California indie singer/songwriter." -- Performer Magazine"
"Joining the ranks of many wonderful female duos (think First Aid Kit meets Hazel and Alice), Annie & Michaela form their own flavor of well-crafted Americana and Country inspired songwriting with tight vocal harmony, sweet but substantial, subtle but rich." It has the makings of an outstanding display of harmony, musicianship, and beauty. Tickets are $12 in advance $15 at the door. Doors at 8pm, show at 845pm. WBO's upcoming performance with The Anata Project, "The Hush Hush Chronicles" received a sweet writeup in the the San Francisco Chronicle. Check it out! Be sure to come by ZSpace in San Francisco this Friday and Saturday, May 17th and 18th, for this one of a kind performance. We are pleased to announce a show at one of our favorite venues in all of San Francisco with an old friend Owen Roberts and his band Shady Maples. Viracocha is located at the corner of 21st and Valencia St. in the Mission DIstrict of San Francisco. It is an intimate, ultimately cool, listening environment and we are so excited to be back sharing our tunes with you in such a great space. Looking forward to it. We Became Owls and John Elliott will be playing The Lost Church on Friday, March 8th in San Francisco. Tickets can be purchased in advance here. We are very excited to share a bill with John and are looking forward to a great night of intimate tunes, laughs, and friends. WBO frontman/songwriter Andrew Blair will be opening for Somebody's Darling, Elliot Randall, and David Luning at Thee Parkside in San Francisco, CA on Feb 22nd. Blair will be trying out a few new tunes and covers so don't miss it. You can purchase tickets in advance here. We Became Owls is pleased to announce a redo of the bill that was supposed to happen a few months back with Benjamin Francis Leftwich and Owl Paws. Benjamin is embarking on his first North America Tour and We. are honored and super excited to be included in the 3rd stop on his USA Tour at Bottom of the Hill. The show is all ages and the doors open at 830pm. The cover charge is $12 at the door or $10 in advance. You can find more information on Facebook here. We look forward to seeing you there! We Became Owls would like to thank everyone who came out to Viracocha on Jan 5th! 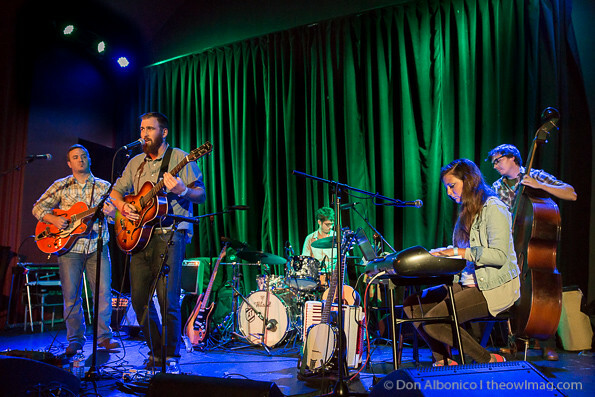 The show was a huge success for the band and for Viracocha. A big thank you to Tom Rhodes for opening the night, Ben Elliott for his mind blowing spoken word piece to open our set and Ned Buskirk and the YG2D family for being so supportive of our music and for letting us begin the evolution of You're Going to Die Presents. And of course, to all the people who came to support us, we LOVE you. We Became Owls is happy to announce a FREE show at this coming First Friday Art Murmur in Oakland, CA. The band will be playing at the intersection of 21st and Telegraph. Beer will be provided by locals Linden Street Brewery and delicious handmade pizzas provided by Fists of Flour. DJs will be playing reggae and dancehall in between sets and the vibe will be all Oakland. If you have never visited Oakland Art Murmur now is the time. The City of Oakland now blocks off a very long stretch of Telegraph Ave from the Fox Theater all the way to 25th Street. Art galleries open their doors to the public, street performers fill the street, musicians are playing on every corner, who know what you might see. Art Murmur is from 5-10pm, We Became Owls will be performing sometime around 8pm. A huge thank you and HOOT to all those that came out to support We Became Owls' first headlining show at Bottom of the Hill in San Francisco on Thursday Nov. 8th. The night was a huge success. Thank you to Owl Paws and John Elliott as well for providing perfect opening sounds. Stay tuned for photos from the show from Carrie Richards Photography. We're playing at Bottom of the Hill on November 14th! You're Going to Die: Poetry, Prose, and Anything Goes is a monthly explosion of tears, talent, and emotion brought to you by Ned Buskirk at Viracocha in the Mission District of San Francisco. This event was the starting point for Andrew Blair back in the days when the event was held at houses and the Duboce Park Cafe. Blair sang some of his first original songs to the early YG2D regulars, folks in the SF State graduate program for English, poets, artists, and cafe wanderers. Buskirk and Blair's friendship formed seamlessly and with Buskirk's encouragement Blair began writing more songs and testing them out at the monthly event. Buskirk has this to say about You're Going to Die..... "IMPORTANT ::: DON'T TAKE YOURSELF SO SERIOUSLY. Come and have fun. The end. Remember. Someday, we won't exist and neither will the English language. If you choose to take yourself seriously, then take yourself so seriously that it's stupid. Ridiculousness is encouraged." The event has grown into something extremely powerful, and Blair and band mate Ross Warner look forward to playing it every month, particularly to test out new material. The next You're Going to Die is on December 4th. There is a suggested donation of $10 at the door but NOBODY will be turned away. The money goes toward future YG2D events and publications. Doors at 8pm. Be there to witness the explosions. Wow. What a great evening/day/morning/night of music at the Bazaar Cafe in San Francisco yesterday at KC Turner's Bazaar Stock #5! Andrew Blair was lucky enough to join John Elliott and Girls and Boys for a session in the round in front of a packed house Saturday night. The event raises money for the Bazaar Foundation for the Arts which raises money for local artist to pursue their passion. Look for John Elliot in and around San Francisco http://thehereafterishere.com/. Looking forward to Bazaar Stock #6! We Became Owls frontman Andrew Blair is pleased to be involved in KC Turner's annual Bazaar Stock concert for the second year in a row at the legendary Bazaar Cafe in San Francisco. Bazaar Stock is a presentation of over 34 local musicians in the round, all day and into the night, starting at 10am and ending at 10pm. Blair will join Los Angeles songwriter John Elliott as well as North Bay indie folkies Girls and Boys in the round at 8pm. All proceeds for the event will be donated to the Bazaar Foundation for the Arts. You can find more info here http://bazaarfoundation.com/. Andrew Blair joined forces with brother/sister songwriting duo Nadia and Joseph Krilanovich (The Lady Crooners) a few months ago and continues to sing and perform with the band around the Bay Area. For more info on The Lady Crooners visit www.theladycrooners.com. Blair will be joining the band this Saturday at The Starry Plough in Berkeley, CA for a wonderful night of music along with Tom Rhodes and River Shiver.